Hello! 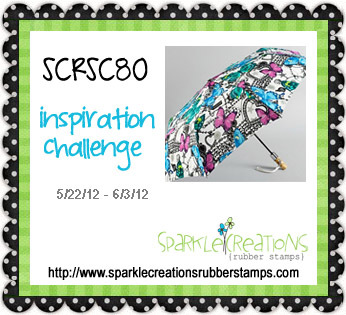 Welcome to week 2 of the current Sparkle Creations Rubber Stamps Challenge (SCRSC80)! The challenge is an inspiration photo! You have until Sunday, 6/3/12 @ 9 PM PST to play along. All of the challenge details are HERE. I inked up Rainy Day Ruby and did some piecing for her umbrella and rain coat. Accessories: Standard Circle Nestabilities - LG (Spellbinders), Markers (Copic), Pearl flourish, Foam tape, Thread, Sewing machine. Love her paper pieced rain coat! Great card! Adorable card Stephanie! 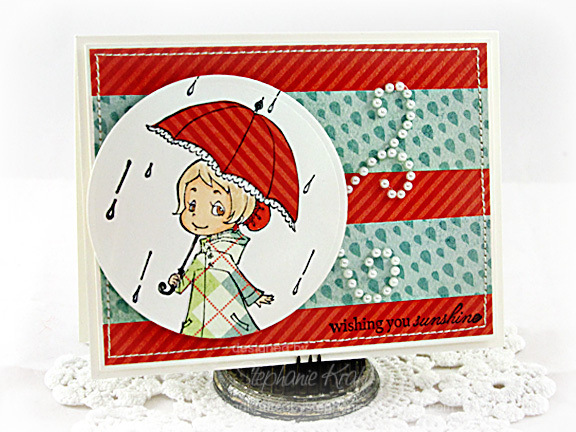 That patterned paper is a perfect fit with that sweet image! This is so adorable, love the colors you used and the cute image.